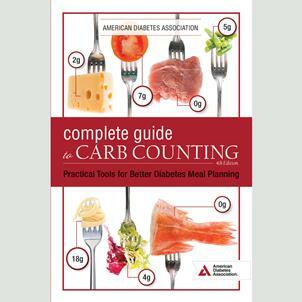 The new edition of the Complete Guide to Carb Counting has all the expert information you need to practice carb counting, whether you’re learning the basics or trying to master more advanced techniques! If you or a loved one has diabetes, you may know that counting carbohydrates is a highly effective strategy for managing blood glucose. However, the thought of tracking the carbs in everything you eat can be intimidating. Fortunately, carb counting doesn’t have to be complicated. This comprehensive guide takes the guesswork out of carb counting so you can plan your meals and manage your diabetes with confidence. The new edition of the Complete Guide to Carb Counting has all the expert information you need to practice carb counting, whether you’re learning the basics or trying to master more advanced techniques. From the grocery store to your kitchen or eating out, this guide will teach you how to count and track carbs and eat proper portions, and help you understand how your diet affects your blood glucose. With this fully updated and revised guide, planning meals and managing your blood glucose is easier than ever!